Whether it’s for fitness or fun, join us for a race or training run. You can find us in Prospect Park, across Brooklyn, Central Park, and beyond! 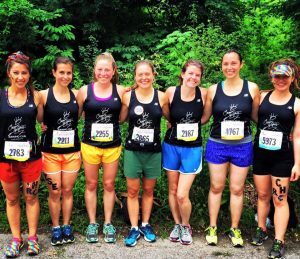 Whether it’s a first 5k, a marathon PR, or epic team fun, we help each other meet our goals! Join us on a training run, check out the schedule and just show up! Register with NYRR for free and put CHRC as your affiliated club. Let us know if you’re preparing for a race or have a goal you’re working toward. We want to support you! We compete in the NYRR club point series, mostly in the top-secret “Banana” division. See our current standing and learn how club points are scored. Start the week off right with an easy loop of Prospect Park! Come out for a structured evening workout with CHRC! Usually in Prospect Park, these workouts will build your strength and endurance. All paces welcome! Liz started running in 2006 because she was too cheap to pay for a gym membership after grad school. She kept running through moves from Washington DC to Kabul to NYC to Cairo and finally to Brooklyn. She can often be found running in Prospect Park with her dog Meera, who thinks runs in the park are really squirrel hunts. I began running in 2015 after being diagnosed with type 2 diabetes as a way to control my blood glucose. I love being a #CHRCnegativesplit because it is fun and challenging plus bananas are my exclusive long distance fuel. Start off your weekend right with an easy 5 miles or 5k in the park! An architect who likes exploring the architecture of the city at an 8:30/9:30 pace. Also, enjoys the stress relief that running affords. In training and need to go long? This conversational pace run is for folks going 6+ miles. Often to exciting places, like Summer Streets, Coney Island, or Governor’s Island, with options for more and less mileage. Check the schedule for more information! A simple commoner who lives in a shed surrounded by chickens, Spencer is supremely honored to serve in her Majesty's Royal Council. Spencer runs often. In 2010 he ran his one and only marathon with a live streaming camera hat (see photo). He occasionally runs ultras and once he bicycled across Africa. Heather is a writer by day and a slow-and-steady runner by night. When she’s not planning fabulous events for CHRC, she’s likely working on an event for her book club, the Readers of the Lost Ark. Her cat, Mr. Ollivander, is an unofficial member of the Royal Council. This island boy is a lifelong Brooklynite who grew up in the carnival island of Trinidad and Tobago. I first started seriously running when I joined a triathlon team back in 2012. After completing my one and done ironman, I’ve since ditched the swim and bike but the running part stayed. During marathon season you can find me in the park at the crack of dawn putting in work or cruising through the park on a sunny morning reminding myself how blessed I am to have to have this park in my backyard in the greatest borough of all. A 4-5 mile run on the dirt paths of Prospect Park featuring stair climb repeats and Brooklyn wildlife! All paces very welcome!